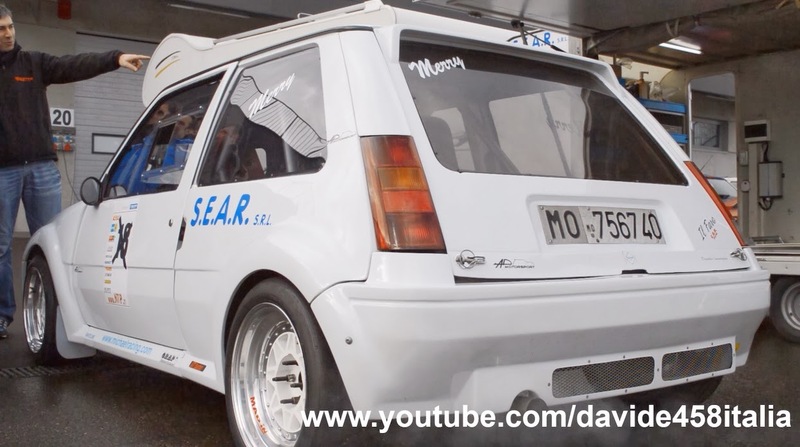 I filmed this modified Renault 5 GT Turbo at the Modena racetrack. In the video you can see some details of the car, the start up of the engine, then accelerations, fly bys and the action on the track. Driver: Merry. The car has original displacement and cylinder block, and it still have the carburetor. The car is under developing by the 1988, so it's hard to explain the modifications! The day of the video, with the turbo pressure at 1.7 bar, the engine had about 300 hp and 38 kg of torque. The car is fitted with Orap suspension and Sadev ST90-14 gearbox. Ho filmato questa Renault 5 GT Turbo modificata all'autodromo di Modena. Nel video potete vedere alcuni dettagli della vettura, l'accensione del motore, poi accelerazioni, passaggi ad alta velocità e azione in pista. Pilota: Merry. L'auto ha cilindrata e monoblocco originali, e monta ancora il carburatore. La vettura è in fase di sviluppo dal 1988, quindi è difficile spiegare le modifiche! Il giorno del video, con la pressione del turbo a 1,7 bar, il motore aveva circa 300 cv e 38 kg di coppia. La vettura è equipaggiata con sospensioni Orap e cambio Sadev ST90-14.